'The Last King in India': Wajid Ali Shah, tenth and last Nawab of Awadh [Oudh; Oude].] Manuscript Note, in English (by a secretary? ), in which the King requests 'Captain Towgood's Company at Breakfast at the Shahmunzil Palace'. Lucknow Residency. 15 February 1851. [Admiral Sir George Back, explorer of the Canadian Arctic. 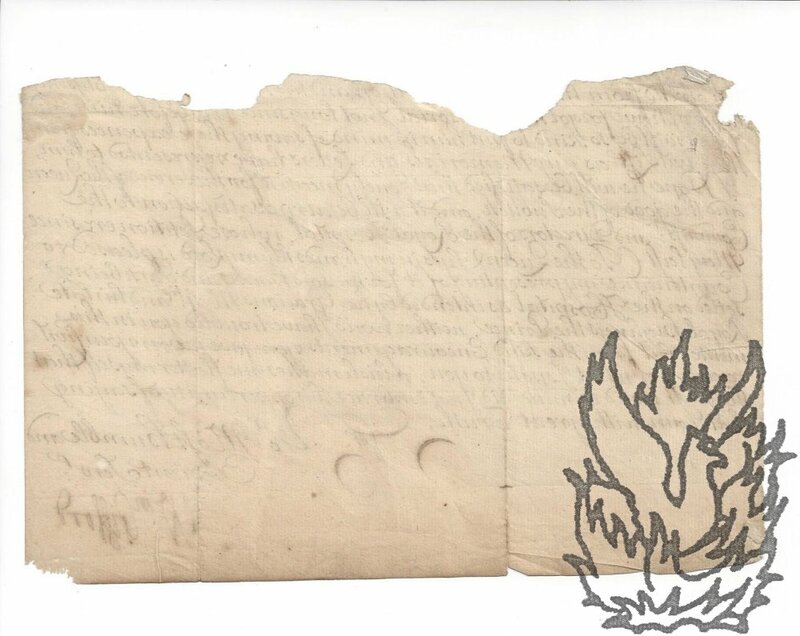 ; his Arctic Mission; Ross] Autograph Letter Signed ('G Back') to 'Captain Maconochie' [Alexander Maconochie], regarding packing for a journey. 8 February 1833. No place. 1p., 12mo. Bifolium. Addressed on blank reverse of second leaf to 'Captain Maconochie'. In good condition, lightly aged. Begins: 'My dear Maconochie | I have not yet done packing - Have they sent the Books &c from the Ad[miralt]y.?' He next refers to 'the Almanack for 34', and his plans for the following day's 'Journey' [to Arctic - see NOte below]. From 1830 Maconochie was the first secretary of the Royal Geographical Society. In 1833 he became the first professor of Geography at the University College London. [Captain Basil Hall, RN, Scottish explorer and author.] Autograph Note in the third person to 'Mr Dinwiddie', requesting 'a Ticket for the Caledonian Church on Sunday'. '14 Conduit Street [London] | Wednesday' [no date]. [ Margaret L. Woods, novelist and author. ] Autograph Letter Signed ('M. L. Woods.') to 'Mr Sladen' [ i.e. the author Douglas Sladen ], regarding a bereavement, 'Captain Christmas', Horace Annesley Vachell and the publisher John Lane. Southwold. 14 November [ 1914 ]. 2pp., 8vo. In good condition, lightly aged. She condoles with her over her 'sad loss last June. I had no idea of it, or I should have written to express my sympathy at the time. I was so much interested to meet your son, & hear how splendidly he had done.' On receiving Sladen's letter she wrote to her neice Betty Brichenough, and wonders if 'Captain Christmas', i.e. Danish sea captain and author Captain Walter Christmas (1861-1924), has heard from her. Fearing that she has mislaid Christmas's card she asks Sladen to write to him on her behalf. [ Captain Basil Hall, RN, Scottish explorer. ] Autograph Letter Signed ('Basil Hall'), praising Florence, describing a view of 'Dom Miguel', and discussing his homesickness. 2pp., 12mo. Bifolium. Thirty-five lines of closely-written text. Addressed by Hall on reverse of second leaf to 'Mrs. Stisted | Villa Broderick | Lucca Baths', with note that the letter is 'For[warde]d By Ch[ristophe]]r. Pearson'. He begins by introducing to Mrs Stisted and her husband 'Col. Toronto Daily Star, Toronto, Ontario, Canada. 21 September 1921. On letterhead of 'Walker House Public Writing Room'. From the papers of the recipient Captain Cecil William Townsend of the British Military Mission to South Russia. The two men had been comrades. In March 1920 'Lt, temp Major Claud Alfred Leonard Pascoe, 2nd London Regt, attd to MGC' received the OBE, 'on the recommendation of the General Officer Commanding, British Military Mission, in recognition of valuable services rendered in connection with Military Operations in South Russia'. See the reference to Pascoe in Scott Young's 1988 biography of Gordon Sinclair. 2pp., 8vo. On an elaborate letterhead of 'Geo. Wright' and 'E. M.
[ Captain William Pryce Cumby, hero of the Battle of Trafalgar. ] 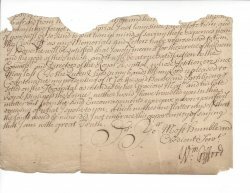 Two Autograph Letters Signed (both 'Wm: Pryce Cumby') to the London solicitor Thomas Wiglesworth, the first regarding a repaired chronometer, the second a power of attorney. Both letters from East Hall, Middleton Tyas [ Yorkshire ]. 23 February and 1 July 1819. Early on during the Battle of Trafalgar, Lieutenant Cumby's captain John Cooke was mortally wounded, leaving Cumby in command of HMS Bellerophon during 'the most glorious battle ever fought at sea'. According to John Marshall's 'Royal Naval Biography' (1823): 'At this early period of the battle, the Bellerophon was closely engaged with the Monarca, as well as l’Aigle, and exposed to a distant cannonade from three other of the enemy’s ships. Printed pamphlet: 'A Vindication of the Catholic Religion; in Reply to the Speech of Captain Gordon, delivered in Brunswich Place Chapel, March 2, 1831. Newcastle upon Tyne: Printed and published by E. Mackenzie, Jun. 129, Pilgrim Street. 1831. 59 + pp., 8vo. Stitched and disbound. In fair condition, lightly aged and worn. The author is not named on the title-page, but the text ends, p.59, with the signature in type of 'CHARLES LARKIN.' The final page carries a list of 'Errata'. [ Sir Anthony Morgan, English army officer and Commonwealth politician. ] Autograph Letter Signed ('Ant: Morgan') to Sir John Maynard, regarding the petition of 'Capt Ed: Lister & Joan his wife'. 'At ye Comttee of Pt sitting in ye Inner Court of Wards this 24th 10r 1656'. 1p., 8vo. Bifolium. Addressed, on reverse of second leaf, with seal in red wax, 'for Serieant Maynard | at his Chamber at ye Temple or elswhere'. In good condition, on lightly aged and worn paper, with outer cover somewhat discoloured. He states that, as Maynard is 'a party concernd in ye Petn of Capt Ed: Lister & Joan his wife', he is desired by the committee to 'meet them in ye Inner Court of Wards' on the following Friday, 'to ye end you may not be concluded unheard'. Their Majesties Receipt of Exchequer, London. 2 July 1694. 1p., 8vo. In fair condition, lightly aged and worn. Customary printed Exchequer receipt, completed in manuscript, headed (manuscript text in square brackets): 'Numb. [946 | 947 | 948] | The  Day of [July] 1694. | Received by me [Richard Earle of Bellemont [sic]] | By Virtue of  Order[s] bearing Date the [2d.] 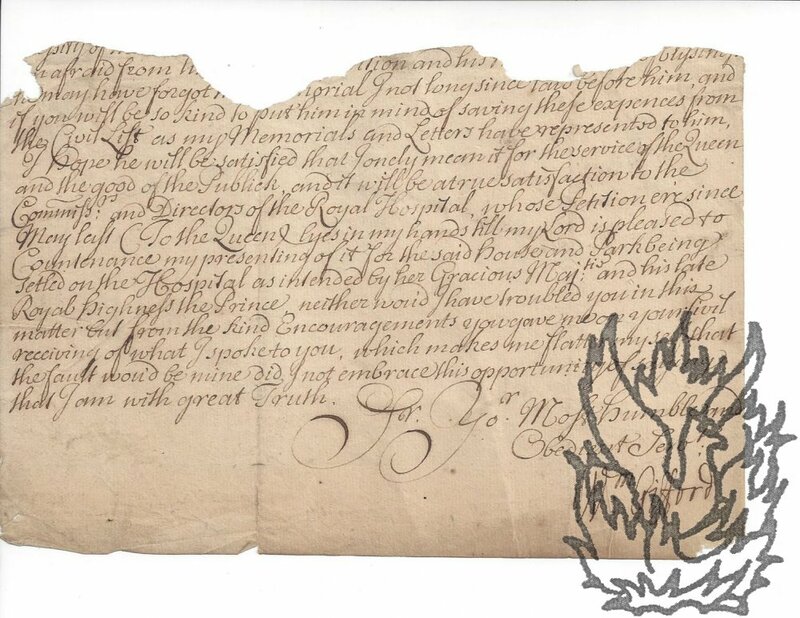 Day of [June 1693:] of [Hen Carew Esqe] One of the Four Tellers of Their Majesties Receipt of Exchequer, the Sum of [ten pounds ten shillings] for [three] Months Annuity Due at the Feast of St: Jno. Baptist last past, of [three] Hundred Pounds'. [ Gallipoli; Dardenelles ] Chief Officer's Rough Log of the 'Government Transport Service' of HM Transport 'Clan Macrae' in the Mediterranean as part of the Gallipoli Campaign. 5 April 1915 to 14 June 1916. Departing from Liverpool and returning to Glasgow, refitted at Alexandria, and taking in Imbros, Kephalo Bay, Port Said, Port Murdro and other destinations. 4to, 346 pp. Divided into two sections, each on different printed forms, bound together in contemporary red calf 4to half- binding (with ticket of Smith & Lane, Printers, 15 Bridge St, Sydney. Text clear and complete, on aged and foxed paper. Binding worn and stained. Part One: 5 April 1915 to 31 January 1916. 4to (leaf dimensions 30 x 25 cm), 252 pp. Part Two: 1 February to 14 June 1916. 4to (leaf dimensions 32 x 25 cm), 94 pp. In a variety of hands, the second section being described as being kept by 'The officers of s/s 'Clan Macrae''. [ Winston Churchill's cousin Captain E. G. Spencer-Churchill on the Nazi menace. ] Printed pamphlet titled 'On Winning the War by Commander Stephen King-Hall, M.P. ', annotated by Spencer-Churchill, with a Typed Letter Signed by him to King-Hall. Captain Edward George Spencer-Churchill (1876-1964), cousin of Sir Winston Churchill, art collector; Commander Stephen King-Hall, M.P. Both items in good condition, with light signs of age and wear. LETTER: Typed Letter Signed ('E G S-C') [to Commander Stephen King-Hall, regarding the pamphlet described below]. 9 April 1940, on Northwick Park letterhead. Perhaps not sent. 2pp., 4to. With minor autograph emendations. [ Printed book. ] Forged, Anonymous, and Suspect Documents. Captain Arthur J. Quirke, B.A. ; with a foreword by John A. Costello, K.C. London: George Routledge & Sons, Ltd., Broadway House, 68-74 Carter Lane, E.C. 1930.
xii + 282pp., 8vo. Brown cloth gilt. A good copy, on lightly-aged paper, in lightly-worn binding. Neat and unobtrusive ownership inscriptions on front endpapers. The author is described on the title-page as 'Captain Arthur J. Quirke, B.A. Handwriting Analyst to the Department of Justice, Attorney-General and Police Headquarters, Irish Free State', and the writer of the foreword as 'John A. Costello, K.C. Attorney-General, Irish Free State'. [ James Morier, author of 'Hajji Baba of Ispahan'. ] Autograph Letter Signed ('Morier') to 'Captn. Roberts', inviting him to dinner with 'Parkes'. No date and place, only 'Thursday', but annotated 'Castellamare | 1830'. 1p., 16mo. Bifolium. In fair condition, on aged and lightly-creased paper. Anotated in pencil 'From Mr. Morier' and 'Castellamare | 1830'. Addressed to 'Dear Roberts'. Begins: 'If you are a good fellow do come and dine with us today at 3. I know it is short notice, but our table holds only a certain number.' Also asks him to join a party to visit Pompeii the following Friday, which also includes 'Parkes who dines here'. Autograph Letter Signed from Rustam Khan to Lieutenant-Colonel H. C. Tytler, Commandant, thanking the officers of the 17th Regiment of Bengal Cavalry [Bengal Lancers], for conferring on him 'the honorary rank of captaincy'. 12mo, 3 pp. 38 lines. Text clear and complete. The two leaves attached along the margins. Signed in Devanagari and European ('So: Rustam Khan Captain') scripts. He acknowledges 'receipt of the Commission conferring on me the honorary rank of captaincy with a deep sense of gratitude to you and all the Officers of the Regiment'. States that he will 'ever cherish a grateful remembrance of all that the Officers and Regiment have done for me'.